Inspiring Figures is a monthly blog column where I share with you people who are catalysts in inspiring and motivating me. They’re really people you should know about. Kicking off this column, I spoke to Tahira, an engineer by day and artist by night. You can read her post here. This month, I’m featuring Matt Burman. A Software Engineer, founder of a hackathon society, a final year Computer Science student and the living breathing Minimalist. Now onto the question I get on the daily, how did we meet? Annnndddd the rest is history. We explored New York, went to hackathons and events together, I hired him as my full-time photographer (😂), we work out together and now we melt hearts online via Instagram 🤷🏻‍♀️ We’re celebrating our year of all these adventures together, today. You can find Matt on Twitter, Instagram and find out more about him on his website. Pauline introduced me to the concept of minimalism. I was immediately intrigued. Most obvious to me at the time was that I was drowning in T-shirts I’d picked up from Hackathons, that it was taking up far too much space. My tiny student wardrobe contained stacks of t-shirts. So, slowly, I bought new clothes that brought value for me, before eventually removing them all. You can find it here. This is actually a slightly outdated version that won’t be updated. It’s basically a glorified list. Each end of a branch is a product. If it ends in a symbol, I don’t have it yet. Question marks mean I should research more into the product to make sure I’m making an informed purchase decision. An exclamation mark means I’ve done a lot of research and I am confident I want to purchase it at some point. I own two bags, and the idea is to be able to fit all of my possessions in them and to be able to pack up to travel indefinitely in minutes. One is a Minaal daily, the other a Minaal Carry-on 2.0. Ideally, I will fit everything into the carry-on and attach the empty daily to the bag. But if I need overflow room, I can fill the daily and hold it as a personal item. Clothing wise, I don’t use many clothes. 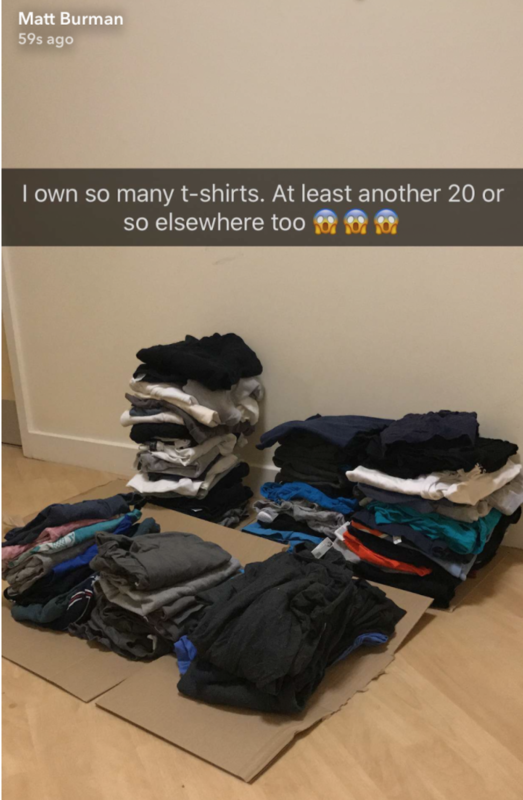 I own more clothes than I actually wear. But generally, I wear the same long-sleeve top now that it’s winter, every single day. This has been an experiment. My experiment was to wash my clothes when I smelt an unpleasant odour on my clothes and see how often I need to wash them. This is literally never the case and *shock* I don’t wash my clothes that often. The only thing I wash regularly is underwear. And to wash my three pairs of underwear, I just walk into the shower with them. I don’t use soap, either for washing the underwear or for my body. I also don’t use shampoo or any hair products. The reason I don’t have to wash my clothes regularly is because of the material. My tops are made from Merino wool, which is a certain breed of sheep from New Zealand. Their wool does not harbour bacteria, which is the reason clothes smell in the first place. Other great properties are that it dries super fast when wet, and it is breathable – keeps you warm when it’s cold but cool when it’s warm. Whenever I look at buying clothing, I obsess over material. I can’t buy clothes from a normal shop, I have to search the internet in the hopes of finding the best material for the purpose of the clothing. How is this clothing supposed to bring me value, and what material will serve me best? My life is so much simpler. Put simply, it allows me to focus my willpower on things that matter. Each day, one has finite willpower. It is depleted by making decisions. The state of lack of willpower is called decision fatigue. I am always looking at how I can reduce the number of decisions I need to make. Always looking to remove or automate repetitive tasks, make them a habit, or else get them done some other way that does not take up my mental space. So I wake up, and I could leave the house in 10 minutes if I needed to. I generally live out of my bag, so everything I need is either in my bag already or I know where it is because I was just using it. No matter what I am doing on a given day, I know I can wake up and be prepared for it. There are a few exceptions like formal occasions, but 99% of the time I am always prepared with minimal thought. So I get to focus my mental space on the things that matter. Not choosing what to wear, or thinking about what I need for the day. Pauline first introduced me to The Minimalists, via their documentary “A documentary about the small things”. This is what kickstarted my habit but now I look for ideas to simplify things from everywhere. I have listened a lot to their podcast. I have read a lot of blogs. Things like zenhabits.net. But I also take inspiration from those who aren’t directly focusing on minimalism, like Tim Ferris. One question Tim asks his podcast guests is “What purchase of $100 or less has most positively impacted your life in the last six months (or in recent memory)?”. This answer often brings about items which can replace other items, reducing many to one. Another question I ask myself, is “If you could only have one item from <category of items>, what item would it be?”. For example, if you could only have one t-shirt, what t-shirt would it be? This makes you think about what you value about items, and what purpose they serve you. You can’t just have the item for “just in case” because it must be critical. Make a list of EVERYTHING you own. And then try to recite that list of items, and be able to explain what purpose each item serves you all from memory. If you’re struggling to do that for an item, get rid of it. If you have too much of some items that serve the same purpose, consider getting rid of some of them. What do you think of Minimalism? Is it something you’ve ever tried or are interested in trying? Hmm interesting! I would like to have less stuff, but somehow don’t see that happening! 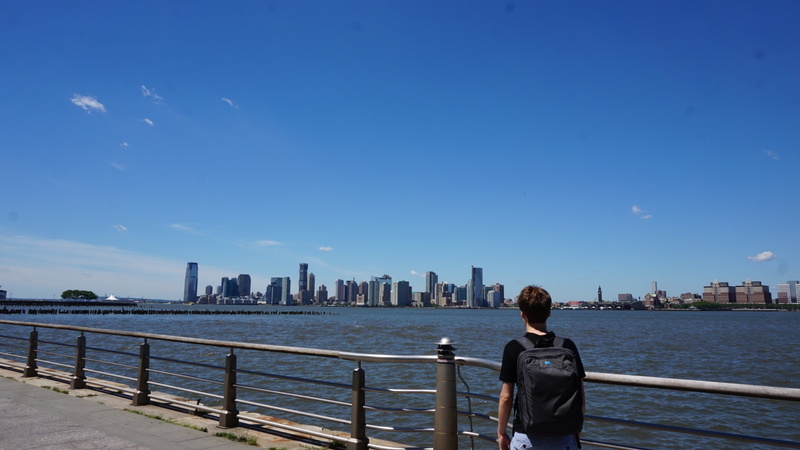 Having less stuff is very difficult but after travelling a lot last year, I realised how it can be done – I can live off my back-pack!